Beyond the turkey and the pumpkin pie, there are so many ways to make this Thanksgiving a memorable one. Spending time with friends and family, for some, is a once a year event. Setting the stage and making things comfortable and enjoyable for everyone is always at the forefront of any host’s mind. With a little planning ahead you can host a memorable Thanksgiving that everyone will be raving about when they go home. Being able to offer your guests a drink as they arrive is a great way to welcome them on the big day. Offering a festive cocktail, wine or beer after you’ve taken their coat can be the first thing you plan upon their arrival. But remembering to offer refills or water is the hard part, so assigning drink duty to your spouse or another guest can be helpful. Prepping as much of the food ahead of time is helpful too. Mashed potatoes, most vegetables, buns, pies and desserts can all be made the day or two before. 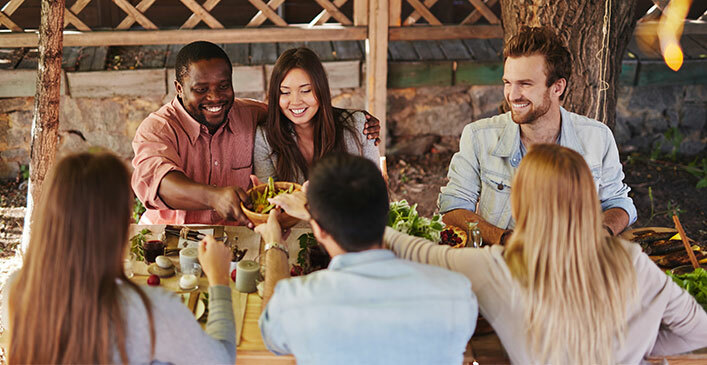 Spending the morning getting the turkey ready and in the oven will leave your afternoon open for socializing instead of stirring a boiling pot or crimping pie crust. Also having your table set beforehand is one less thing to worry about. Having the prep work done before your guests arrive will give them warm memories of a stress-free host and not have them wondering if they could have helped you more in the kitchen. If you make the creamiest mashed potatoes or the best apple pie, bring out those recipes for Thanksgiving. Setting a memory in someone’s mind with food will always bring them back for more. Maybe it’s grandma’s maple fudge recipe you all grew up on is a way to provoke happy memories. Finding your best recipe and repeating it year after year is a great tradition to start with family. If another family member has a dish that you dream about, ask them to bring it along and extend the tradition. For out of town guests, having a nice, clean room to sleep in goes a long way. Use fresh, clean sheets, fluff the pillows, and supply towels at a minimum. Having a few extra toothbrushes, travel-sized soaps and lotions, and slippers can mean the world to a guest who has forgotten an essential. Making them feel at home is a great way to create a memorable visit. Whether you host a tropical-themed dinner or a blast from the past party, thinking outside the box and planning a themed dinner can be fun for everyone and break the mold of the traditional sit-down dinner. You can send out invitations or emails to everyone explaining the theme and have everyone show up ready for a party. Who says Thanksgiving has to be turkey and stuffing? Maybe this year it is a honey ham with a coconut cream pie and tiki decorations, or disco music with pigs in a blanket and a Jello mold. Have fun with it, and it will be a holiday for the history books. Having an annual chess game with grandpa or a flag football game before dinner is a wonderful way to create memories and traditions. As the family changes and grows, the teams can vary and the rules of the game can adjust to the different age groups playing. Maybe you keep a logbook that notes the scores every year or a small trophy to compete for. Everyone will be strategizing and planning their victory for weeks leading up to game day. The memories will last a lifetime. Gone are the days of painfully posed family photos taken with a camera timer on a tripod, while your father runs frantically to get into the shot before the flash goes off. We are in a time where we take endless amounts of photos, but rarely is everyone in them. They are more spur of the moment, and less posed and planned. Getting a more candid family photo once a year is a great way to create memories. They can be emailed or printed and mailed to all in attendance and is a nice way to chronicle your family as the years go on. If you have a pool in your backyard and don’t live in a warmer climate, why not make Thanksgiving the last family swim of the year before you close it for the winter? Those brave enough can face the chilling challenge of taking a dip when the pool is at its coldest. Or better yet, crank the heat up just for the day so everyone can enjoy a warm dip. As time goes by, there will likely be a few kids around your table. Including them can start memories with them from an early age. Having a fall scavenger hunt, hot cocoa, and a craft to make can help keep them occupied and having fun. As they grow, so can the activities. With young teens, having them set the table or create a centerpiece can help them feel included in the festivities. If your family is on the larger side, planning to draw names can be a great way to cut down on the cost at Christmas. Organizing a Secret Santa can also be a fun way to plan ahead for the upcoming holiday. Have the kids take turns drawing names from a hat and get everyone involved. Help the kids make their letters to Santa, and take a few tips on gift ideas for them in the process. Fall is a great time to plant a tree. Why not do it as a tradition with your family? Watching them grow year to year is something everyone can share. Change up the variety or maturity of the tree to keep it exciting year after year. Spending time together, enjoying each other’s company and rejoicing in the holidays is a great way to unwind and relax. Catching up with family and reconnecting warms everyone’s heart. Enjoy this holiday together and be thankful for each other.